In a society highly dependent upon the Internet for gathering information, online consumer reviews have become the new word of mouth. Ratings on Amazon, TripAdvisor, Angie’s List, Rotten Tomatoes, and Yelp have helped consumers narrow down a barrage of choices. For local San Diego businesses, learning how to manage these online review sites has become as important as managing the business itself. A Harvard Business School study, conducted by Assistant Professor Michael Luca, found that for every star change in rating on Yelp, revenues of independent businesses are affected by 5 to 9 percent.1 Chef Peter Briones of La Miche Kabobgee in Kearny Mesa recognizes Yelp’s influence. La Miche Kabobgee opened ten months ago and serves French- Mediterranean cuisine. A majority of their customers work from 9 a.m. to 5 p.m. and come during their lunch break, so the chef has to maintain a balance between delivering fresh, made-to-order food and rapid service. Briones realizes that he may have to deal with unfavorable reviews when several large groups come in at once due to the time it would take to get the orders ready, but he also understands that he cannot compromise the quality of the food, as it is currently their competitive advantage. Fifteen years ago, consumers needed to pay for AAA or Zagat membership to receive printed guides with restaurant reviews. Yelp disrupted that model with its free online service. Currently, it is the dominant review platform for restaurants. As of the end of 2012, there were approximately 47 million local businesses nationwide listed on Yelp, but only about 994,000 of these local business locations have claimed their Yelp pages. Businesses can claim and register their accounts at no cost and Yelp verifies the registration through an automated telephone verification process.2 By claiming the page, businesses can communicate additional helpful information to customers and can address negative reviews. Yelp generates revenue through the sale of advertising. In 2012, a lion’s share of its revenue stream came from local advertising, which consists of services such as sponsored search, discounted deals, gift certificates or enhanced listing. However, it is from this same revenue source that Yelp continuously receives allegations of extortion. Several class action lawsuits have been filed by small business owners accusing Yelp of demanding $300 or more a month to hide negative reviews and highlight positive ones.3 These complaints have been dismissed due to lack of evidence. As more and more customers rely on the reviews of others to make a purchase decision, there has been a proliferation of fraudulent reviews on these online review sites in an effort to exploit the system. This is known as “astroturfing,” or the practice of writing false reviews.5 New York Attorney General Eric T. Schneiderman announced that a year-long undercover investigation into astroturfing and false endorsements in various online review forums has recently been completed. The investigation found that some businesses paid freelance writers from the Philippines, Bangladesh and Eastern Europe for $1 to $10 per review, or solicited to hire reviewers on sites such as Craigslist.com, Freelancer.com and oDesk.com. One company required freelancers to have an established Yelp account that is more than three months old, with more than 15 reviews and at least 10 Yelp friends to get around Yelp’s filtering algorithm. The New York Attorney General’s Office reached agreements with 19 companies to cease writing fake reviews and pay a total of $350,000 in penalties. Luca’s Harvard study presents four main findings about fraudulent reviews. 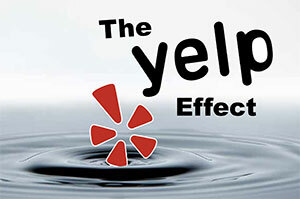 First, around 16 percent of reviews on Yelp are false and are consequently filtered. These reviews tend to be either extremely favorable or extremely unfavorable. Second, phony reviews are more likely to be committed by restaurants with fewer reviews or by those that have recently received bad ratings. Third, chain restaurants are less likely to commit review fraud because consumer reviews are less influential to their already established reputations. Lastly, restaurants are more likely to commit review fraud by leaving a negative review for a competitor when there is increased competition with nearby restaurants serving similar types of food. Last year, Craft and Commerce in downtown San Diego’s Little Italy chose to be creative in handling their undesirable Yelp reviews — they played a recording of the complaints over the loudspeakers in the restaurant’s restroom. This play on humor and mockery invited quite a bit of media attention to the restaurant. Though, after a few days of receiving publicity, some people started writing bogus onestar reviews just so it could be played in the restroom.8 The restaurant still continues the practice to this day and has maintained a four-star rating despite attracting false reviews. The growth of smartphone usage with its location-based service apps makes it easier for consumers to make purchase decisions.9 Often times, the decision is made passively by browsing through the list, considering businesses with four- and five-star ratings, and disregarding the rest.10 As a result, online consumer reviews can make or break a business, so it is important to monitor them regularly, manage them effectively and maintain a four-star or above rating. For local mom and pop shops, this is more significant because one negative review may potentially cost them a considerable number of customers, or worse, even their very businesses. With a limited budget, independent businesses can still manage their own online consumer review sites without hiring online reputation management services. They can accomplish this by first claiming their pages on the review sites. This will enable them to enter all the accurate business details on the page and update the information as changes take place. This will also allow them to monitor reviews, actively manage them and limit the damage done to their reputation when negative reviews appear. In addition, independent businesses can build their reputation by creating a following through social media sites such as Facebook, Twitter and Instagram.13 Building a loyal customer base presents the opportunity to provide special services for the customers such as sending an invitation for a complimentary visit or offering discounts. Owners must realize and accept that negative feedback is a natural part of doing business14 and understand that each instance requires a different response. They must be open to receive undesirable reviews and embrace them as a way to help detect the weaknesses in the business. In responding to comments, it is important to stay professional. If an incident is damaging, businesses may consider using the media to clarify the situation and apologize publicly to customers if necessary. Vanessa Cabiling (Rady MBA, 2014) is a budget analyst for a large government agency. She focuses on strategy, data analysis and market research. Her interests include consumer behavior, predictive analytics, ideation and IT innovation.